Instead of losing 6,500 child-care spots and 30,000 after-school spots, the city will actually have more spots next year than this year. And although Bloomberg had slashing about 400 school aides from the city payroll — more than half as many as were laid off last year — no layoffs will take place. Lets hope it's all true (though I'm still hearing of lots of teachers being excessed from schools next year. Please email me if you hear something about your school. ) But tonight, let's sit back and watch these terrifically cool Brooklyn parents strut their stuff. P.S.10 Flash Mob 6-19-2012 (Official) from Benton Collins on Vimeo. The Legislature passed the Governor’s bill on disclosure of teacher evaluations yesterday. No matter that the evaluations, based primarily on test scores, are unfair, unreliable, erratic and have up to a 85 point error rate. No matter that the legislation will allow parents to call or email to find out the rating of their child’s teacher. No matter that the ratings of all teachers at public schools will be published, by school, grade and subject, making it all-too-easy for parents to gossip and trade information about which teacher got which (totally unreliable) score. No matter that for some reason, in our electeds’ continuing , and unaccountable deference to charter schools, they will remain free of any damaging and morale-busting disclosures. Still Bloomberg went ballistic because not every teacher’s name will be published in the newspaper, and says he will have every school call every single parent with children in grades 4-8 and offer them this information, because parents have a “right to know.” UPDATE and correction: According to this piece in GothamSchools, Bloomberg said that all parents will be called -- up to a million -- to offer them this information. The ratings will also posted on each child's ARIS page-- which may be in violation of the intent of the law, since parents are encouraged to log into ARIS for lots of other reasons. Hah! 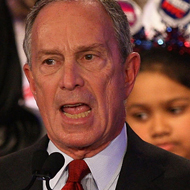 Bloomberg has no respect for parent rights. When we protest school co-locations or closings, he says we“don’t understand the value of a good education.” When wepush for more schools to be built to alleviate overcrowding, he says we have no right to be involved in this issue either. And the parent’s right to know? I have submitted FOILs (Freedom of Information Law requests) for information that I have been waiting three years for, without a substantive response. And this is far from unusual. The DOE and other city agencies constantly flout the law and stonewall when it comes to the public’s right to know. In February, I asked for the performance evaluations of the Chancellor’s Leadership team, and I am still waiting. So today I thought I would email Bloomberg and Walcott. I have also put a clock on my website in order to mark the time I have waited for these performance evaluations, which by law, are the right of every citizen to obtain. If parents have a right to see the ratings of their children’s teachers, which according to most experts are statistically unreliable, don’t they also have the right to see the evaluations of top employees at Tweed who are making six-figure salaries? Or are teachers the only ones who, in your view, should be subject to potentially demoralizing disclosures? The final performance evaluations of all of the members of the Chancellor’s leadership team for 2009, 2010 and 2011, in the NYC Department of Education, including but not limited to every Deputy Chancellor, as well as the performance evaluation of t he Chancellor himself. To the extent that these records are readily available in an electronic format, we request that they be provided in that format. Please provide responsive records as they are ident ified, rather than waiting to gather all records. The Freedom of Information Law requires agencies to respond within five (5) business days of a records request. Please contact me by phone at the below number or by email at leonie@att.net with any questions. Thank you in advance for your timely consideration of this request. Reactions to sample Common core questions; what do you think? NYS Education Commissioner John King released sample Common Core questions this week. Here are some responses from parents and former teachers on the NYC Education list. Please take a look and add your comments below. Well, I looked at the sample 3rd grade ELA questions. Utterly bizarre. I would never put this material in front of my 8-year- olds (avid, enthusiastic, proficient readers both). The Tolstoy translation is stilted and boring, and full of inappropriate vocabulary (hoarfrost? caftan? threshing-floor?) It's as though the selection were made to project this to the kids: "reading is excruciatingly dull and confusing; maybe you thought you could do it, but I'm here to tell you 8-year-olds are stupid and teachers (and test designers) are smart. You're going to have to work like a dog and suffer a lot if you want to pass this test." Honestly, I thought the practice tests that came home all year as homework were bad, buy they were just mealy, unreadable trivial passages followed by absurd and confusing questions. This CC sample is worse: it's perverse, overtly hostile to young children. A former 3rd grade teacher: The 3 grade math tests when published by CTB-McGraw Hill were NEVER EVER challenging or difficult for the students. I just looked at the 3rd grade math assessment and they are asking the children to understand algebra. Question 4- fraction problem. I had to re-read that question and multiple choice answers a few times in order to get the problem. Third graders were never taught to divide with fractions, let alone with measuring, both difficult concepts to master. This is a concept which is typically introduced in 5th grade. Question 6- is a hidden 2 part question which a lot of third graders may not get. Questions 8, 9- and 10 seem fine. I took a quick look through the Grade 8 Math sample questions. Nearly all of them are posed at a level consistent with Algebra I, meaning that Grade 8 students are being expected to master work at that level. It's a desirable goal, for sure -- I'm in China right now, and their Grade 8 students are already at or beyond that level. Regardless, the CC sample questions provided are very heavy on analytic geometry (linear relationships, equation of a line, slope, etc.) along with similarity of triangles and the use of exponents and scientific notation. Ten of the eleven sample questions address one of these three topics -- the remaining one involves the first step taken in simplifying an algebraic expression. The quality of the questions is generally not bad, although many students will find them quite demanding. I had issues with two of them. One question (#2) is multiple choice, and three of the four choices are too easily determined to be the same, leaving the fourth as the only possible right answer. While reaching that conclusion about the other three requires knowledge of how to combine exponents with like bases, the process of elimination to get the answer means that half the required knowledge (knowing that 1/25 is the same as 5^(-2)) is no longer being tested. A computer can do 1000 operations in 4.5 x 10^(-6) seconds. How many operations can be done by this computer in one hour? Express your answer in scientific notation. I suspect you will be scratching your head for a few moments (or minutes?) trying to figure out where to begin. Now imagine the typical Grade 8 student confronting this. It's not a trivial problem, although the math is not overly difficult once you figure out what to do. Interestingly, I believe the correct answer is 7.9 x 10^11, yet the sampler gives the answer simply as 8 x 10^11. Yet it's clear that the question intends for the student to multiple (2.2 x 10^8) by (3.6 x 10^3), resulting in 7.92 x10^11, or 7.9 x 10^11 using significant digits (another piece of knowledge Grade 8 students will need to have that often isn't presented until Grade 10 Chemistry class). It would certainly be a welcome step up to see Grade 8 students routinely mastering Algebra 1, but I suspect the challenges in doing so will unfortunately be rather sizable. Your child must read 50% informational text, and enjoy it! Also over the weekend, Robert Pondiscio of Core Knowledge critiqued Sandra Stotsky, who had questioned the 50% split for non-fiction on our Parents Across America blog. Stotsky, the main author of the highly-regarded Massachusetts standards, had written "It is amazing that one badly informed person [David Coleman] could single-handedly alter and weaken the entire public school curriculum in this country, without any public discussion." In contrast, Pondiscio called the Common Core standards "common sense." As a parent, I do not agree that mandating 50% informational text in grades K-5 and 70% thereafter is common sense. Instead, it seems arbitrary and wrong-headed, and if enforced, may kill the love of reading among many children. In recent years, it is nearly miraculous to many how many children have been caught up in reading long, imaginative novels like Harry Potter, and series by authors like Rick Riordan and Suzanne Collins in their independent reading, instead of spending even more hours playing video games. My 8th grade son reads as many as twenty or more novels a year as part of his assigned reading for school, along with other “texts”. In fact he reads many thousands of pages a year. Should he be forced to read thousands of pages of non-fiction to match this? or should he instead be discouraged from reading novels, so that his “informational text” quota can be more easily reached? David Coleman, the author of the Common Core standards, often natters on about the need for students to cite “evidence” in their writing, but where is the evidence that replacing fiction with equal amounts of informational text will help kids in terms of literacy or otherwise? All that he and others cite is that students have to read more non-fiction in college and that this is primarily what is tested on the NAEPs. But this is not evidence that a 50/50 split in the early grades is called for; or 70% thereafter. This is like saying because a student may be assigned Heidegger in college, it should be assigned in elementary schools. Where are the controlled studies, random experiments or pilot projects anywhere in the country, or indeed the world, to show show that this sort of rigid mandate has helped kids learn better? Doesn’t common sense also means testing out your personal preferences somewhere, before foisting them on the entire nation? Just as in the corporate reformers who seem intent on killing creativity by prescribing end-of-course multiple-choice tests in the arts, the Common Core's rigid mandates represent a stifling straitjacket, implemented with no thought on how they may undermine the joy of reading for our children. For more on the Common Core, see our blog here and here, and the PAA blog here and here. Meanwhile the Pioneer Institute (who opposes them) estimates that implementing the CC will cost states $15.8 Billion; the Fordham Institute (who supports them) as much as $8.3 billion. Maintain rigorous and enforceable classsize policies in the early grades: Policymakers and education leaders should resist the urge to relax small-class policies for early grades students, even when budgets are tight. Too bad NYC DOE is now mandating that early grade classes in 1st through 3rd grade be packed with students with IEPs, up to the contractual maximum of 32 per class. Meanwhile, Gov. Cuomo responded to criticisms that his commission lacked any parents by choosing Carrie Remis, a pro-charter parent who now lives in the Rochester suburbs but claims to represent inner-city parents. Rochester parents, please feel free to comment below. He also added two more business executives to ensure that his pro-corporate reform position will be represented even more strongly: Stanley Druckenmiller, a hedge fund billionaire and backer of the Harlem Children’s Zone, and Sandy Weill, former Citigroup chairman. The dates of the “meetings” start in NYC on June 26; other dates are here. It's not clear whether they will be hearing from any parents other than Ms. Remis. 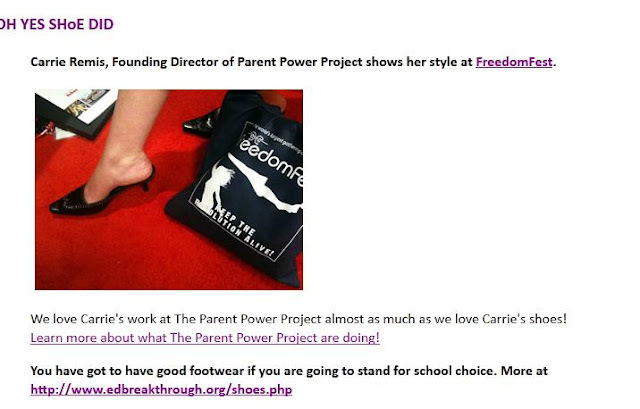 Ms. Remis and her chic shoes are featured here and below. Happy Father's Day and successful shoes shopping to all. The DOE earlier released a power point to reporters and the PEP that showed NO significant gain in either achievement or attendance for students with disabilities in Phase I of the program. And despite the bland assurances of DOE’s Shael Suransky at the hearings that schools will be provided with any additional funding they need to make inclusion work-- and Laura Rodriguez, head of the special education office, admitting that many of these students need small classes to be successful, the sternly worded directive to principals mandates that they must accommodate children with special needs in inclusion classes up to contractual maximum of 25 kids in K, and 32 in grades 1-5, with no exceptions and no capping below these levels. For recommendations that are not in the best interest of students, regular progressive disciplinary measures for school leaders and IEP teams will apply. These huge class sizes will badly undercut any improvements that one would expect from inclusion and eliminate any ability for teachers to "differentiate instruction," which were DOE's buzzwords of the day at the hearings. For more on this, see my testimony in which I point out how this is the first time I have seen explicit instructions to principals that they must RAISE class sizes far about the C4E goals and far above what is appropriate for students without special needs, not to mention students with disabilities who require extra attention and support. I am all for inclusion, but what happens when you have a classroom with 30 students; one teacher; and one to three attention-deficit children or children with motor sensory issues? The entire education experience is destroyed for all the children in the class. If you do not address the class size problem, adding children with special needs furthers burdens the teacher and takes away from every child's education. This already happens at my son's school. In large classes, these students tend to “act out”, sometimes aggressively, as their needs are not being addressed, undermining learning conditions for all children. My principal went to her budget meeting and was told that she must excess 2 regular education and 2 special education teachers. We currently have five special education teachers as well as an IEP teacher. To meet the needs of the IEP students in the school, we will need a K,1,2 and a 3,4,5 self-contained 12-1-1 classes AND 3 ICT [inclusion] classes....that means we will need five spec education teachers. The budget person told my principal that she would need to excess two special ed teachers. When she asked the budget person how she would meet the needs of the students, she was basically told to put them in some other class. I attended a UFT meeting with DOE people speaking about the special ed reforms. They SAID that there WOULD be funding to meet the current needs of our IEP students. SO then why are we being cut the special ed teachers we need? I stand in the hallway of the school building, my back leaning against a wall and legs crossed. The halls are brightly lit and eerily quiet. Across from me is a typical school fire alarm, with a message hastily taped up next to it: IF YOU PULL THIS ALARM YOU WILL BE ARRESTED. Sue and Lizzy are seniors at Robeson, which they affectionately call "Robe" (rhymes with Moby). They are outgoing and well-versed, both leaders in their school. Lizzy even served on the Mayor's Panel for Educational Policy as a non-voting student representative. She sat on this panel when they voted to shut down her school, and gave an impassioned plea to thousands of parents, teachers and advocates. In short, she's level-headed but embattled. "Kids walk out of this school every day," the pause in her voice betraying sadness. "Just not together like that." She's surprised that the principal suspended each and every student who walked out that morning. She feels particularly betrayed, perhaps, because all along she had helped liaise with the man. He was, in fact, new to the building and to the fighting spirit of the school. When the city announced it would be targeted for closure, the students held a rally on the front steps, marching band and all. 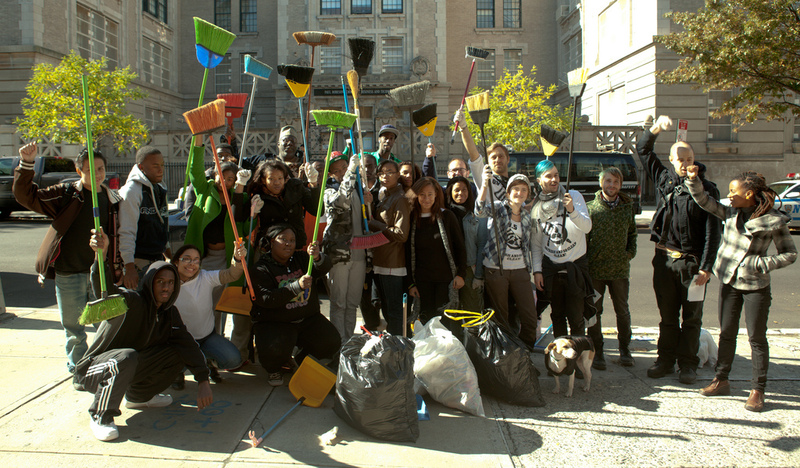 When some of them visited Occupy Wall Street last October, they were so energized they organized a community clean-up around their school with the OWS Sanitation Team. I came into the building for the first time in the fall of 2010, at the request of community activist and hip-hop pioneer Rodney 'Radio Rahim' Deas. Rodney belongs to the Coalition for Public Education, which opposes mayoral control for the things it has done to schools like Robeson. Rodney had heard of me as "that teacher who used hip hop in the classroom" when I taught digital media to drop-outs in Red Hook. The kids had just been dealt a blow at Robeson and they needed some positive energy, so we came in. That year, Robeson had 3 principals. None of them seemed particularly interested, however, in the work we were doing after-school with students: media literacy, guitar lessons, math tutoring, and more. Like many teachers in the DOE, Stefanie Siegel - a veteran teacher and a mother figure at Robeson - shut her door to keep the learning in. The hallways were filled with cops, renamed School Safety Officers and stripped of their guns. They didn't need guns when their mouths fired off obscenities to the youth, and their metal detectors and wands turned the school into a prison. "The weekly contact with Justin and Rodney in the midst of a heated political debate around school closures and the first hand experience in trying to have their voices heard in this arena created a serious political consciousness in our young people," remarks Stefanie in hindsight. We didn't mind that our oasis of learning continued unchecked by administration, and in fact it made our work easier. The students designed curriculum and presentations for workshops and conferences, even scoring 1st place at the 2011 NYU Social Justice expo. Our colleagues heard about our work through the grape vine, and started to ask us about "those fighters at Robeson". 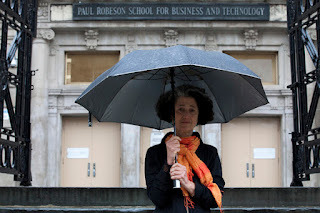 In the meantime, the DOE, the state, Pearson, and others sent their suits into Robeson to spread the blame around. No one seemed to discuss how over-crowded the school had become when Bloomberg's "small schools movement" sent kids from farther and farther away flooding into the building. The dwindling number of large high schools in NYC were becoming Ellis Islands of refugee students: kicked out, counseled out, or dropped out of schools the DOE had turned its back on with "phase-outs". We plotted a plan to save the school that fall. We formed Robeson Unite, an effort to boost morale and organize as a united front against the closure. Students built a website, and spread the word through social media. They put out statements and landed meetings with DOE brass. They struggled daily to communicate updates at the break-neck pace of the power shift in their building. Like a home in foreclosure, ownership of a once-anchor of the community was being re-negotiated, but the students weren't invited to the negotiating table. Three months later, when the night of the final decision came, the feeling had already sunk in at Robeson that things were about to change in a big way. Teachers would lose their jobs, classrooms would switch hands as new, better-funded schools with "start-up grants" entered the building. No new freshmen would be enrolled in the school, but the existing students had little choice but to go down with the sinking ship. Most weren't offered any opportunity to transfer or given any additional resources to cope with the changes adults far away from them were imposing like "policy missiles", as one unabashed education advocate Brian Jones put it. The phase-out had begun. The beginning of the 2011-2012 school year came with little fanfare, and the once-crowded halls of the school began to look more and more deserted. The DOE doesn't properly track the outcomes of students in schools like Robeson, but it's safe to say they are dismal. While 13% of Robeson students are homeless, those who do enter the school building each day face constant verbal abuse from school safety officers. The metal detectors thwart their attempts to bring cell phones into the building, so they pay the lady at the corner bodega $1 each day to store the phones. (Both they and their parents have an interest in the students having their phones on their way to/from school.) Recognizing this highly-profitable venture, entire industries have emerged in NYC of entrepreneurs in vans outside schools offering to stash students' phones for the day. The principal sought to counteract this trend by quietly offering to hold the phones for the day, only to use them as a leash to keep students until the 3pm bell. When students began to cut class en masse in the afternoon, administrators coupled their truancy with the squeeze on cafeteria space to justify moving lunch to 1:56pm. The students, used to being shuffled around by now as the target of policy missiles, barely minded and most left at that time to go buy food instead of eat the bland "free-free" DOE offered them in the cafeteria. The phase-out had severely damped the spirits at Robeson, but another project Radio and I were embarking on caused a stir of interest: Occupy Wall Street. When I was arrested in Zuccotti Park speaking on a megaphone to the General Assembly, I missed class and students worried what had happened to me. The next week, they came uninvited to Zuccotti Park to see what was happening. They saw parallels between the police treatment of peaceful protesters and their friends in East New York and Canarsie, stopped and frisked without cause for wearing a hoodie or looking "suspicious". It wasn't long before the students were brainstorming actions and planning actions like the community clean-up. 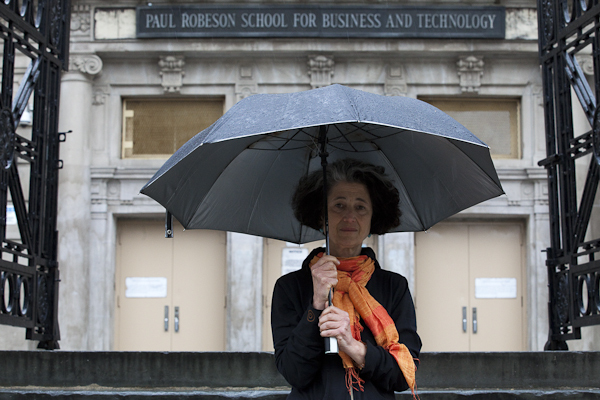 The energy of Occupy had infected schools, spreading from school to school. A group of parents and teachers started Occupy The DOE, taking over school board meetings and shutting them down. At the February PEP meeting it was students who brought the meeting to a halt, and the DOE sent in rows of police officers with flex-cuffs. Officers pushed past young children and grandparents to intimidate the youth who had come out to protest the DOE's treatment of their school. Nobody was happy. This energy, contained for so long and suppressed by myriad layers of top-down technocratic school administration, could not be contained any more at Robeson. With the support and endorsement of the Coalition, Chuck D, M1 and many others, the student leaders gathered together and called for a Mass Student Walkout on May 1st, in solidarity with the call from Occupy Wall Street. The plan was to converge at Fort Greene Park to discuss their grievances, which ranged from privatization of schools to the failed cell phone policy. Radio and I applauded their conviction, and told them they could count on our support and that of the broader Occupy movement in their courageous action. Would Paul Robeson have walked out with the students that spring morning? I believe it unequivocally. He would have linked arms with a generation of youth who have been sold out and their futures mortgaged to pay for the follies of a few old men who they'll never meet. He would have looked the principal in the face and asked him why he didn't walk out along-side them, but chose rather to suspend them and incongruously force them to read Martin Luther King's Letter from a Birmingham Jail during their in-school suspension. On further reflection, it is only fitting that the students returned to their school building - I won't call it a school, a term reserved for places of learning - to read that sacred document. It was "because injustice is here" that King wrote that letter, and injustice is alive and well at Paul Robeson High School. It has become a literal jail, its windows barred up and its entrances locked to visitors. When Radio and I returned to the building after the walkout the principal ordered us arrested, an order which the school safety officers would not dare enforce in the presence of students and teachers, so the NYPD blue-shirts were called in with their guns. This is an environment of incarceration, not education. This is an environment of imprisonment, not liberation. And Paul Robeson would be ashamed. Justin Wedes is an educator and activist and the co-founder of the Paul Robeson Freedom School, a pilot program beginning in Williamsburg, Brooklyn this summer. He has taught at-risk youth in Brooklyn, Detroit, and beyond. He was a founding member of the NYC General Assembly, which brought you Occupy Wall Street, and fights for fair education funding and smaller class size. This summer, he and Rodney Deas are launching the Freedom School in honor of both the famous African-American singer, activist, and scholar as well as the students of Paul Robeson HS, who have endured the impossible for their right to a free and appropriate education. To support the Freedom School, click here or join us next Wednesday night at For My Sweet, 1103 Fulton St, Brooklyn, for the launch party. video of Pearson protest today!